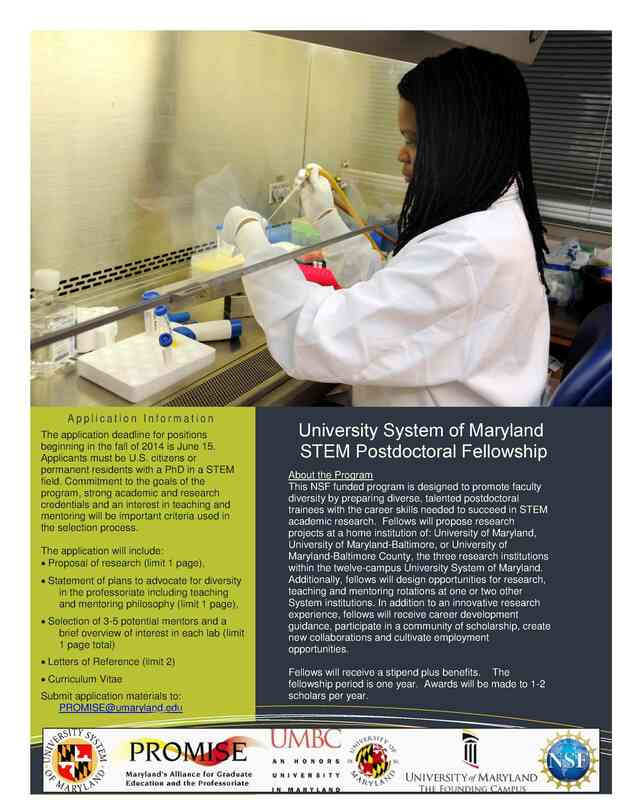 PROMISE AGEP: Maryland Transformation (An NSF AGEP-T), is proud to announce the opening round of applications for the new University System of Maryland’s STEM Postdoctoral Fellowship program. This NSF funded program is designed to promote faculty diversity by preparing diverse, talented postdoctoral trainees with the career skills needed to succeed in STEM academic research. Fellows will propose research projects at a home institution of: University of Maryland, University of Maryland-Baltimore, or University of Maryland-Baltimore County, the three research institutions within the twelve-campus University System of Maryland. Additionally, fellows will design opportunities for research, teaching and mentoring rotations at one or two other System institutions. In addition to an innovative research experience, fellows will receive career development guidance, participate in a community of scholarship, create new collaborations and cultivate employment opportunities. Fellows will receive a stipend plus benefits. The fellowship period is one year. Awards will be made to 1-2 scholars per year. The application deadline for positions beginning in the fall of 2014 is June 15. Applicants must be U.S. citizens or permanent residents with a PhD in a STEM field. Commitment to the goals of the program, strong academic and research credentials and an interest in teaching and mentoring will be important criteria used in the selection process. UPDATE, June 2014: Please note that the submission address is PROMISEMD@umaryland.edu. Please do not send applications to PROMISE@umaryland.edu. The MD must be part of the email address.